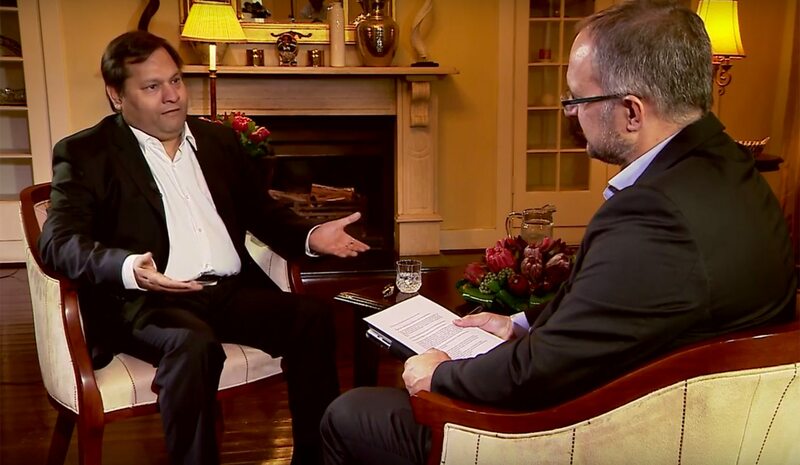 On the 16th of February this year, I conducted an interview with Ajay Gupta. I was thrilled to be given the opportunity to do so, only to be completely frustrated and angry that I was then not allowed to talk about it, or publish anything, until now. The reason was that a non-disclosure agreement was attached to the interview. However, Bell-Pottinger, the international PR company contracted by the Gupta family to manage its reputation, did not live up to the assurances provided. Ajay Gupta lied. But now, finally, because a portion of the interview has emerged on YouTube, I am in a position to disclose what happened. By STEPHEN GROOTES. In February this year I received an email from the now famous Bell-Pottinger (BP) offering an interview with “an important person”. But to find out who this person was, I signed a non-disclosure agreement. I thought it was Thabo Mbeki, who was writing furious newsletters at the time. After signing the agreement I was told it was Ajay Gupta. But there were conditions attached. I could do the interview, in Saxonwold nogal. But BP would control the cameras and the recording. This was a problem. They wanted to release the interview online “after a light edit”. Ja, right. A “light edit”. To get around this, I stated that I would bring my own recording device. BP could hold onto this until the interview had been released. If there was a huge fight about definition of “light edit” afterwards, I would have my version as a back-up. Bell-Pottinger is based in London. There, it is common practice for a person in the middle of a scandal to give one single interview to one journalist. That interview is then “pooled”, or made available to everyone who wishes to broadcast it. The BBC and ITV and Sky take it in turns to provide the interviewer, and everyone is happy to play it. Of course, money does not change hands. And no money changed hands here. Interviewing high profile people, particularly those who have much to lose, sometimes comes with some conditions attached. Once, I interviewed Morgan Freeman, the actor, at the Saxon. There, his people controlled the camera, the lights, the angles, everything. Once you were done (and you only got six minutes), they said cheers, took out the video tape and gave it to you. After a couple of days of discussion with Bell Pottinger, I prepared questions. As per the non-disclosure agreement I was allowed to tell only the line-managers at EWN and 702. No one else. Of course, there was no attempt to claim that anything was off-limits or could not be asked. My prepared questions, almost all of which I had time to ask, revolved around the big issues of the time, and recent political history; Des van Rooyen, Mosebenzi Zwane, and their relationship with President Jacob Zuma. During the interview, there were no interventions, or attempts to stop me going down a particular line. It took place in Saxonwold, which was already politically famous. At the time, we didn’t quite realise how important cellphone records of people like Des van Rooyen and Brian Molefe were going to make it. After discussion with my EWN boss, Katy Katopodis, I agreed to do the interview, obviously subject to the condition that I would have my own recording in the event of further dispute. I knew at the time that the Guptas were of dubious morality. I did not expect them to be outright thieves. They, or the people they hired through Bell-Pottinger, still have my machine, and have simply not responded to my attempts to get it back. Arriving in Saxonwold we were disappointed. We did not get into the compound. We got into a small house (for Saxonwold) which contained a lounge, a hall, and an area outside. In the room were Ajay Gupta, Nazeem Howa, Katopodis who had agreed to come with me, Victoria Naylor-Leyland from Bell-Pottinger, and at least two technical people to whom we were not introduced. After the usual pretense of everyone being polite to each other, we got going. Ajay Gupta was quite softly-spoken, it took time to get under his skin. Several times he said things that I thought could not be true. At the time, back in February, the Financial Mail had broken the story about how Mineral Resources Minister Mosebenzi Zwane had gone to Switzerland to help the Guptas broker the deal to buy the Optimum Coal Mine from Glencore. Zwane’s spokesperson had confirmed that he did go to Switzerland. You can imagine how shocked I was when Gupta flatly denied that this was the case. I’ve done literally thousands of interviews in my time, almost all of them over the phone, on live, or pre-recorded radio. Several times I’ve sat down with someone and interviewed them face to face in front of cameras. This was a tough interview, I threw everything I had at him. Some of his answers seem to have been blatant lies, particularly his claims around van Rooyen and Zwane. Of course, we didn’t have the State Capture Report then. To break the tension at one point, during a water-break, Howa asked me to “stop the softball man, where are the tough questions”. As the cameras went off, the urbanity returned, everyone shook hands and smiled. I asked when we would get the interview, when could I play it on the Midday Report. It would be tomorrow or the day after I was told, as per our agreement. Oh Stephen, you naive young man. Of course, what happened at first was this; nothing. Two days later I tried to call Naylor-Leyland. She didn’t answer. I called Howa, he didn’t answer. But it did provoke an email from Naylor-Leyland asking me to deal with her, and not to call him again. A week passed, each day starting out with the hope that today I could broadcast the interview, and every day ending as the previous twenty-four hours. Eventually, I emailed her, and said that I would like my recording device back. I was promised that it would be returned. I’m still waiting. In the meantime, time was marching along furiously. The context around the Gupta family changed. The interview started to lose news value as the context changed. I was very very frustrated. Then, a few weeks after the interview had been recorded, I got the chance to interview Howa on the Midday Report. I used the chance to get as much from that interview out into the public domain. It was a chance to get around the non-disclosure agreement. I put many of the questions from that original interview to Howa, and received many of the same responses. I pondered often, as more information around the Guptas came out, and as it became apparent what Bell-Pottinger really are, if I should break the non-disclosure agreement. But I was concerned about my legal position. I had, unfortunately, given my word. And the interview itself was becoming less and less relevant, the issues that it had raised were no longer important. At the time of course, I didn’t know about Brian Molefe, I didn’t know van Rooyen had been to the compound. As events unfolded, the interview lost its power completely. There was another problem. As the context changed, it became harder and harder to justify, ethically, reporting on the interview. The answers to the questions may have been different because the context was different. I would have been reporting on answers without giving the interviewee a chance to respond to the current situation. That may have been unfair. But I was still annoyed. Annoyed that I could not get around this agreement. Annoyed that we had been treated in this way, annoyed that they still had my recording machine. I was also annoyed with myself. Obviously I should have done far more research on Bell-Pottinger, and should not have signed any such agreement with them. Photo: A frame grab from the Grootes – Gupta interview.